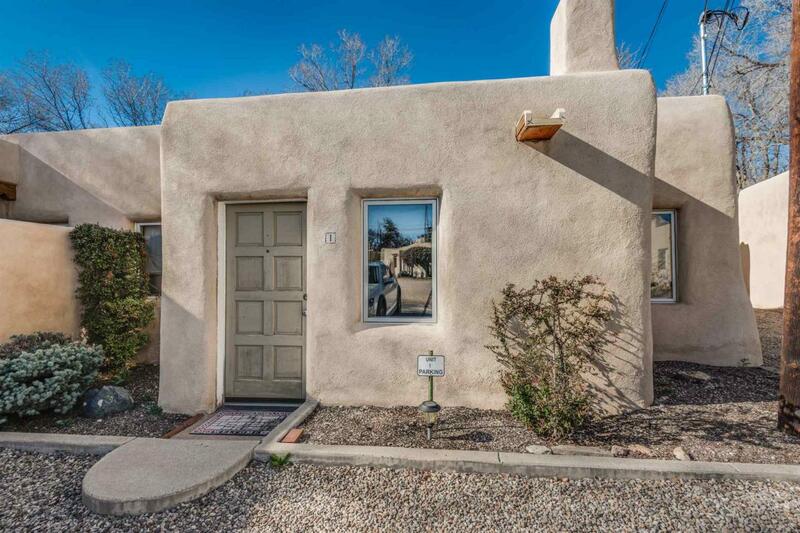 Experience an intimate slice of Santa Fe in this 2-bedroom/1-bathroom condominium tucked into a quiet and comfortable neighborhood in the South Capitol area. Wood-paneled, square-cut beamed ceilings, wood floors, and glass-paneled access doors throughout, create a stream-lined, efficient look amenable to the vagaries of many a design style. The master bedroom has an alcove off the entrance featuring an extra-large kiva wood-burning fireplace that also provides warmth and character to the living room. A bar with counter seating overlooks the efficient kitchen with a skylight, track lighting, dishwasher, microwave, oven/range and washer/dryer machine. Multiple archways, corbels and nichos provide hints of old New Mexico style. A generously-sized, fenced patio with a fire pit offers space for outside entertaining or room for pets to romp. Just minutes away from Canyon Road, the Capitol, the Railyard and the downtown, this gated property offers privacy and convenience and a special place to call home. Assessments And Other Fees $1077.86 Quarterly. Listing provided courtesy of Neil Lyon of Sotheby's Int. Re/Grant. © 2019 Santa Fe Association of REALTORS®, Inc. MLS. All Rights Reserved.